I have to say, I still love orchids. After 35 years of growing them, I am still surprised, happy, and in this case, particularly honored to write about them. As most of you know, I am the owner of Florida SunCoast Orchids located near Myakka City, an established orchid nursery since 2002. Most of the plants we have available for sale are Cattleya types, Phalaenopsis, Dendrobium and my favorite orchid genera, the Encyclias! My introduction to Encyclia orchids began in the 1980’s when I lived in St. Croix in the US Virgin Islands, and the first one I ever exhibited orchid won an AOS award for a plant native to the islands, then called Encyclia bifida. Since then, I must say that I have not had as much personal excitement about Encyclias as I felt two weeks ago at the Tampa Judging Center for the American Orchid Society. This article is about the journey that culminated in my earning an AOS Award of Quality. Normally, I don’t take plants in for judging. There are just so many things going on that I don’t usually have the time. However, a few friends of mine, who are in the judging program, encouraged me to bring in the Encyclia orchids I had in flower for an evaluation. I don’t know about you, but I have never felt completely at ease when I‘ve taken plants to be micro-scrutinized! It’s a long drive and things happen in transit that are unforeseen, not to mention the timing of when judging occurs, grooming the plants, and a dozen other things that are required for a plant to be properly entered! But enough of that, let’s go back and do a little history on these orchids, okay? I started hybridizing orchids many years ago and I have seen lots of plants come and go from my collection and business. On a trip to Miami about 15 years ago, I picked up a few Encyclia orchids from local vendors and was very glad to acquire some species I hadn’t had before. Among them were mature plants of Encyclia profusa, and Encyclia rufa. (The former is from Colombia and the latter from the Bahamas.) I instantly saw the potential of a new hybrid in my mind! Out came the toothpick, and the long waiting game began. That was back in 2005, and through patience and hard work, the plants started to flower in small 4” pots in 2008. I didn’t think much of the cross at that time, except that many of them were nicely colored and fragrant—which to me is of paramount importance. Another year went by and they flowered again, still in their 4” pots, but growing rapidly. In 2009, I decided to register the hybrid cross with the Royal Horticultural Society (RHS) in London, which is the repository of all orchid hybrids recognized with valid genealogies worldwide. The name I chose was Encyclia Rufly Profuse, (pronounced roooof-ly J) a hybrid pairing of Encyclia rufa x Encyclia profusa. The blue registration form went out snail mail in those backward by-gone times of six years ago to the orchid registrar, who, in turn, mailed the acceptance and validation of the name to me. I received it an agonizing 4 weeks later. LOL. From the start of their flowering in 2008, I had sold about 200 +/- small plants, and through mishandling, killed several, too. However, a few years ago I decided to keep about 30 for myself as I was growing fond of them for several reasons: they produced loads of little perky yellow flowers on tall stems that lasted for several months and they were fabulously fragrant! Friends were flowering them and very happy with them, too! A nice outcome, I’d say. We ever-so-carefully placed them in crates (after hours of work and yelling and meticulous spiffing and spit-polishing — well, okay…no actual spit…) and with a deep breath and one eye closed in fear, they were shoved in the back of my minivan for the long ride. Hope and prayers were liberally sprinkled on them as the door closed and I headed out of town. Of course, as I pulled up to the USF campus door where the Judging was held, it started to rain. Of course it would. But two kind-hearted judges helped me unpack the precious cargo and lug them inside the building. (Along the way I heard a few whispered comments about hernias and backaches.) It took several trips to get the baker’s dozen of plants through the doors and into the cloistered room. We had floral-taped the inflorescences together to snuggle them as close as possible in the crates. It seemed as though each of the plants tripled in size as they flared open, much like a yellow peacock’s fantail, as soon as I cut the tape, releasing them from captivity. Not to mention, they took up 4 tables of space which raised more than a few eyebrows. But the dazzling array encouraged me to hope. Judges, being judges, play their cards close to the vest when looking at prospective plants. And rightly so, as many of them are colleagues and friends, and don’t want to reveal any thoughts prematurely. After all of the judges had gathered in the room, teams were chosen and plants from many other entries were divvyed up. Now the sweating, um…er…waiting began. Eventually, they pulled 2 orchids from the grouping of Encyclia Rufly Profuse for consideration! Note: Plants are judged against many standards of quality in order to be awarded, such as previous awards if any, lineage, improvement over parents, consistency, color, form, presentation, etc. It is a long process at times and must be done correctly and thoroughly. Because it matters. Several plants were passed by for awards that day, but several plants from other entrants were awarded. About 2 hours into this monthly convocation, I got the word! Two plants of the hybrid cross had been given individual quality Highly Commended Certificate (HCC) awards (which must predicate any possibility of a group award.) YEA! The next level was to judge the other plants as one group to see if they all were deemed worthy of further consideration. To be sure, the high bar of expectation was set! A few minutes later, with a smile and a handshake of congratulations, the judging team leader gave me the good news. — The Award of Quality was granted! I was in shock. Grateful, honored and proud to be the recipient of that prize. 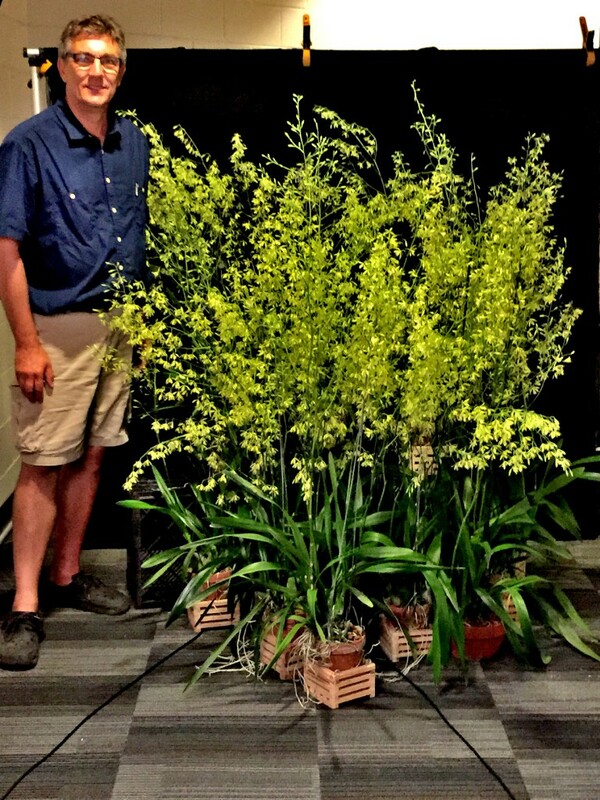 I learned that the award was actually doubly so, since I had made the hybrid AND grown the group award–with brownie points just for getting all of the huge orchids there! The accompanying photos are the actual awarded orchids. 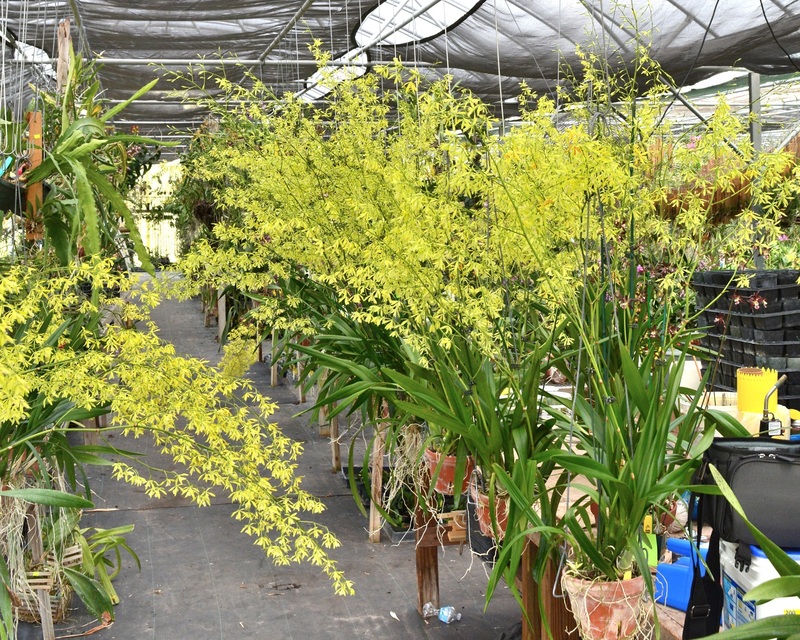 The average height of the flower spike was 4-5.5 feet tall and carried 300-500 flowers per plant. A quick estimation was around 4000 flowers at presentation. Gorgeous, elegant stems of wonderfully fragrant yellow flowers graced each plant, and a very, very grateful grower looking on. Thank you, AOS judges of Tampa! FloridaSuncoast Orchids specializing in growing Cattleya and Encyclia hybrids as well as a large selection of pendulous Dendrobium, Vanda and some Phalaenopsis orchids.